The Dallas Companion Animal Project has teamed up with Show Your Soft Side and Sports Marketing to bring the nationally recognized and award-winning Show Your Soft Side anti-animal cruelty campaign to Dallas. 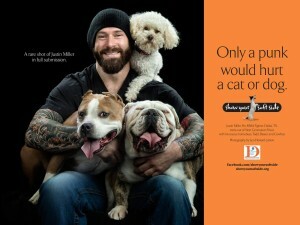 The campaign, aimed at stopping animal cruelty before it begins, features local sport celebrities showing off their “soft side” with their beloved pets. Over a recent two-day period at Fox Sports Southwest Studios in Las Colinas, the following nine celebrities volunteered to pose for photos with their sometimes rowdy, often unpredictable, but always loveable pets. was created in response to the alarming incidence of animal abuse in Baltimore. The campaign’s goal was to change the mindset of young people who often view the maiming and torturing of defenseless animals as a sign of “toughness” or “manhood.” Those abusers often graduate to even more violent crimes. This nonprofit organization has expanded their efforts beyond Baltimore to show that being a man has many facets to it, including a “soft side” when it comes to animals. Each makes the point that only a punk would hurt a cat or dog.